is having a little giveaway! It's almost impossible for me to go into a store that sells anything for mailing and not pick out something or two or three. Sound familiar? I still have a turntable like the one shown and mostly play Christmas albums on it, I love the sound of old vinyl. A big cup of hot chocolate, playing a board game or making something yummy in the kitchen with a great old Christmas album playing, makes my happiness meter soar! The headphones look like ones that were popular in my generation nice and cushy, not the kind that stick inside my ears and make them sore if they aren't the correct size. Do you ever have sore ears or just me? Of course, I rode a bicycle like that, at my grandmother's house (with a big basket on front) and the word Balance, well it's my "key"word for the time being. The sticky flags are just bright and happy, I'm sure they will make an appearance on an envelope or two I send out in one way or another. We all need a little something bright and happy! So there you have it, all my reasons for buying the above. 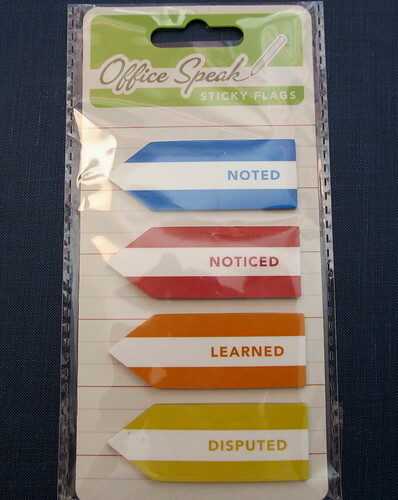 I'm giving away a set of 4 cards with envelopes and a package of sticky flags. If you'd like to participate in the giveaway, please leave a comment and share either a word that's important to you and why or one of your favorite quotes. I'll leave this open until Friday, April 5th in the evening cst. My favorite quote is- "The real fun lies in the journey but not in reaching the destination." I have always loved this quote and totally agree with it. I'd love to participate too! My favourite quote is: "Those who mind don't matter and those who matter don't mind." by Bernard M. Baruch. I think it is a nice philosophy. One of my all time favorite quotes/saying is "Every time it rains, a flower grows." and it's something I will get tattooed on my wrist in the near future. :) It has helped me overcome a lot of trouble this year, so it means a lot to me. Yes, I am in. By the way you have a wonderful blog, thanks for sharing. My favourite word is chalomot, hebrew for dreams, because we never can stop dreaming. My husband is a hi-fi buff and has a turntable. The kids next door saw it - the 7-year-old said "What's that?" Her 10-year-old brother piped up "I know, you put a black thing on it and it goes round and music comes out". Nothing like kids to make you feel ancient! "I don't think writers are sacred, but words are. They deserve respect. If you get the right ones in the right order, you might nudge the world a little or make a poem that children will speak for you when you are dead." Beautiful quotes and comments--what fun reading your blog, Angie, and your reader responses, too. My quote comes from author Jonathan Swift: "May you live all the days of your life" and I guess my word of the year (after having pneumonia three years in a row) is Life! Hi Angie, this is fun. I have way too many favorites, but one quote that has always impressed me is by Dan Miller. "If it isn't your job to do it, perhaps it is your opportunity." I just think that the person who goes beyond their job description is the person who will be successful in life. It's about integrity and being more than you think you are. That's what attracts opportunity. Several words come to mind when I think about my year ahead such as gratitude, positivity, calm, focus, intimacy, potential. I'm not sure which one is the most important but I have decided to focus on my relationship by adding more intimacy, showing gratitude for whatever happens, turning negative events into positivity and remaining calm under stress and seeing the full potential in myself and in circumstances. I don't have any quotes coming to mind right now but my favorite word these days is 'live'. There is so much in this word that we tend to forget in our everyday life : we forget to breathe, we don't notice the small things that are what make us happy, we neglect our friends and family. We think we have time, we run after things we don't really care for and meanwhile, we forget what life is about : live. What a cool giveaway, and neat cards. I enjoy reading your blog via RSS. One of my favorite quotes is: "Life is not about waiting for the rain to pass but learning to dance in the rain" -- Vivian Greene. Fun giveaway! One of my favorite quotes is from a Rick Springfield song: "Nothing that matters comes easy, Nothing the comes easy ever really matters." What a lovely give-away. I really hope I win this time, but I have to wish us all good luck or bon chance. Wonderful Mail - Learning Etsy Too! 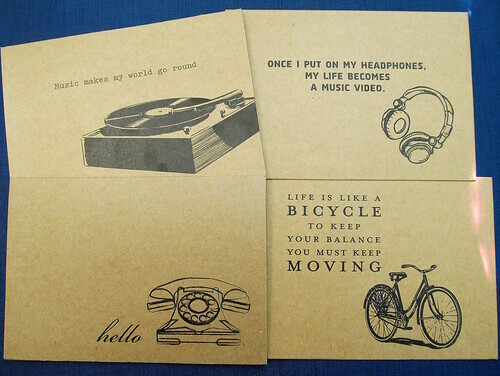 Hello Morning-Letters & Postcards Too! I Never Get Tired of Postcards. Ever.